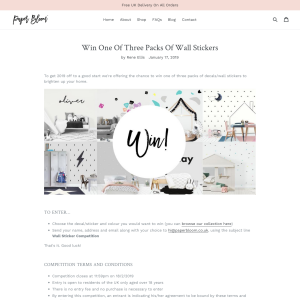 To get 2019 off to a good start we're offering the chance to win one of three packs of decals/wall stickers to brighten up your home. Paper Bloom reserve the right to amend or alter the terms of competitions and reject entries from entrants not entering into the spirit of the competition. Reasonable efforts will be made to contact the winner(s). If the winner(s) cannot be contacted, or are unable to comply with these terms and conditions, the Promoter reserves the right to offer the prize to the next eligible entrant drawn at random, or in the event that the promotion is being judged Paper Bloom reserves the right to offer the prize to the runner(s)-up selected by the same judges.